Employee recognition is constantly evolving. As people’s tastes change, new generations enter the workforce and recognition’s effectiveness in driving employee engagement continues to get results. 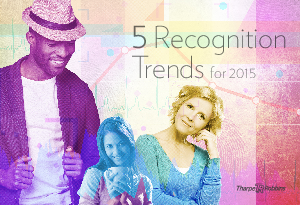 2015 is going to be the year that you’ll want to know your recognition program is working the way it should. You need to partner with someone who can proactively guide you through these changes. TharpeRobbins can help you. With The Recognition Effect® methodology, our approach ensures that you have programs that will engage employees and drive performance, while providing them with The Recognition Experience™ they deserve. Download the e-book today and learn more.